The Indian Premier League (IPL) is a professional Twenty20 cricket league in India contested during summer (April and May) of every year by franchises representing Indian states and cities. The professional cricket league was founded by the Board of Control for Cricket in India (BCCI) in 2008. There are currently eight teams participating in this cricket league. The IPL is similar to the American style of hiring players and transfers and works on a franchise based system. The IPL has drastically changed the way the game of cricket is played in India and integrated the entertainment industry into it as well. During the IPL, the advertising revenue of Sony Pictures Network increased from seven billion Indian rupees in season 7 to 13 billion Indian rupees in season 10. According to the BCCI, the 2015 IPL season contributed 11.5 billion Indian rupees to the GDP of the Indian economy. The IPL has the highest attendance amongst all cricket leagues in the world and in 2014 was ranked sixth by average attendance among all sports leagues. As of 2017, the IPL has the highest viewership amongst all the professional sports leagues in India. The television viewership of the finals of the IPL season 10 accounted for around 39.4 million impressions. In 2010, the IPL became the first sporting event in the world to be broadcast live on YouTube. There have been ten seasons of the IPL tournament. The inaugural edition of the IPL was won by Rajasthan Royals in 2008. The current IPL title holders are the Mumbai Indians, who won the 2017 season. 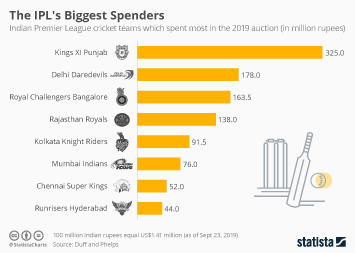 According to Duff & Phelps, the brand value of the Mumbai Indians in 2017 totaled around 106 million U.S. dollars.